This weekend hurt a bit. Besides the physical struggles of having a sub-par result (my first DNF in any race longer than a 10k), clumsily falling over and over in the mud, and pummeling my legs for about 38 miles I am also somewhat mentally scarred. But that can be a good thing. It gives me a new perspective to work with. I actually needed some ego bruising this weekend because I feel like I’ve been taking a lot of things for granted in my life this year (not majorly bonking in my first couple of ultras for example). Having this minor set-back of not running up to snuff this weekend at the North Face 50 Endurance Championship was a learning experience that will be applied to my future running. Sometimes it’s good to get a dose of reality (and failure) and re-learn to ride the downs with the ups. First off, I will point out some of my mistakes (mistakes that a nube ultra runner such as myself might make but hopefully will learn from and apply to the future). 1. Ten minutes before the starting line I realized that I forgot my headlamp in my parent’s car that was parked over 1 mile away. Luckily my dad had an extra (crappy) light that I was able to use instead. The sun didn’t rise fast enough! 2. I decided that since the fire roads seemed to drain well the day before that they would in fact not be muddy and that I would wear my road racing flats (The SCOTT Race Rocker instead of my new SCOTT trail shoes) because I usually am all about speed and minimalism instead of traction. They worked great for the first 20 miles. 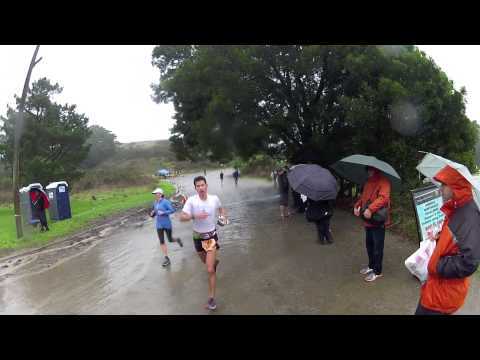 What I failed to realize that the descent to Muir Beach became a mud pit on the second lap after all the runners (including crowds of 50k runners) had passed over it. I fell quite hard at least 5 times and basically had to crawl up the hill using my hands to lift my body up in places. I felt like Bambi trying to learn who to walk for the first time. ..on ice! That was another silly and costly mistake. But I still had a long way to go. I still had muddy miles that I didn’t know were coming. I had a double descent and ascent to Muir Beach that I didn’t know even existed because we totally missed it on the first lap. Nonetheless at that point just getting first or finishing strong didn’t even become the focal point. No, I entertained in my mind that I wanted to try to win by 10 minutes. I wanted to make a statement! So I kept pressing the pace in the middle miles (obviously too hard as I did end up bonking). “No” I replied, confident that I had followed every orange ribbon and arrow sign on every path.. There were a couple times in the early dark miles where I stopped at intersections to double check these things. After getting lost at Chuckanut and UROC I was ultra (pun intended) paranoid about going off course. Adam Campbell and Jason Wolfe had run together with me in the dark for the first 18 miles or so. Surely we had gone the right way?! Suddenly doubt started creeping into my mind. I started thinking, dwelling: Why was 4th place so far behind that I didn’t see them at the half-way point out-and back stretch around mile 23? Why did it seem like we hit the Tennessee Valley aid station two times in a row (and there was almost a 10 mile stretch in there without aid!)? A sinking feeling developed in my stomach: “Crap, if we actually cut the course we’re going to get DQed for sure!” It was upsetting. I thought about the $10,000 for first place slipping away. Just like that. Months of training and anticipation down the drain. With hundreds of 50k runners out on the course ahead of me I clearly saw the Muir Beach “out-and-back” the second time around in the light. When we ran this section of the course on the first “lap” in the dark with the rain and fog we had about 15 feet of visibility. I didn’t even recall a fork in the fire road being there the first time! There was no sign with an arrow that I remember seeing and there was no person there to direct us in the early morning. The trails both ways were “correct.” The path we took that first time in the dark had the orange marking ribbons for the 50-mile course. We had simply continued on up the trail instead of doing the “out-and-back with a loop” down to Muir Beach because we never even saw it that first time! I was devastated. Sliding down the muddy hill in my road shoes I took my first big tumble. My handheld 20-ounce water bottle from Ultimate Direction popped out of my hand on impact and toppled down the hill. Rolling in the mud I started bleeding. Arms, knees, and my back got a bit cut-up and bruised. I feared a pulled groin and/or career ending injury. When I finally made it to the aid station at Muir Beach I saw Meghan of iRunFar.com and finally was able to confirm that I had not been to this part of the course before. Discouraged and thinking that I’d surely be DQed I still decided that I was going to try to run the full distance anyway…I was going to do this whole “out-and-back-with a loop” twice to make up the exact distance that we had cut out earlier. I wanted to do it out of principle, to just see where I’d be at in the race if I hadn’t made this unfortunate error earlier in the day. At that point I had know idea who was in what place or whether or not I was going to be DQed (it later stood that if I had in fact finished I wouldn’t have been DQed). I slogged up and down that Muir Beach hill twice and ran around the parking lot loop a couple times. The mud made me sick to see because I knew I couldn’t run up the hill anymore due to traction issues and on the way down I just kept falling over and over and over. My arms were cut and bleeding and I started bonking. Officially (or shall I say unofficially) I was still in 2nd place (I saw Miguel Heras climbing up the hill on my last way down) but I was done. So done that I realized I was going to have to drop (a tough choice to make and something that I’ve only done 3 times in hundreds of races). At that point I couldn’t even jog to the next aid station…so I walked. It was encouraging to see so many people that passed me ask me if I was alright. Another elite runner that got lost, Tim Parr came back and walked it in with me for the last 30-40minutes…saving me a couple more times from slipping and falling as I walked down the muddy trails. One runner who came by, (bib #1275 I think) gave me his jacket as I was freezing cold in the rain and wind (I hope he got his jacket back as we left it with a note at the finish line area). It was inspiring to really see how kind and supporting ultra running community is and I really appreciated all these other runners’ concern for my well being. Amazing group of people out there! Congrats to all those who finished and stayed on the course for the full distance. The rain storms definitely made it a mud bath out there and the vertical was still quite challenging despite all the last-minute changes. I was humbled again by the competitiveness of the race and what the course dished at me. As always it was quite the experience. I hope to redeem myself in my next ultra! PS Also a big thanks to those of you who helped support Vo2max Productions in donating to UNICEF last month! I wish I could’ve won a bit of money at this race to add to this donation but unfortunately that was not the case. Next time.